Philippine Airlines, also known as PAL, has finally received the green light to move forth with its ambitious expansion efforts in the United States after restoration to Category 1 by the Federal Aviation Administration earlier this year. Between 2008 and 2014, PAL was prohibited from changing aircraft gauge, adjusting flight frequency and adding new destinations in the United States after failing to comply with minimum safety standards set by the International Civil Aviation Organization (ICAO). Within days of receiving clearance, PAL stated intentions to augment its number of US stations by adding service to New York, Chicago, Miami and San Diego, with hopes of either operating nonstop routes from its Manila base or via Canada. PAL currently operates nonstop service to Los Angeles, San Francisco, Honolulu and Guam from Manila, and also flies nonstop to Vancouver with continued service to Toronto three times per week. PAL has loaded inventory for a new 4-weekly service to New York JFK airport, slated to commence on 15 March 2015. It will also be increasing its Toronto services from three to four weekly. PAL has already taken advantage of Category one liberalizations to upgauge capacity and frequency on routes to Guam, Honolulu, San Francisco and Los Angeles. Elsewhere in its existing network, PAL has already announced capacity adjustments. Its LAX flight is being up-gauged to a twice-daily route with three additional weekly frequencies. The 77W will replace the Boeing 747-400 and Airbus A340 used on the 11 current frequencies, but a spare Airbus A340 will be deployed to absorb the additional 3 weekly flights that are being added. San Francisco will remain daily, but its aircraft will also see the 747 phased out in favor of the 77W as well. PAL is also allegedly more than doubling capacity to Guam (from 5 weekly to 14 weekly) and Honolulu (from 3 weekly to daily) as well as replacing its Honolulu route with a more fuel-efficient Airbus A330. However, the tough reality PAL must face is that even with enhanced air traffic freedom between the Philippines and US, attempts to make flights to markets like New York and Chicago commercially viable will be extremely challenging, if not impossible. Moreover, PAL’s decision to deploy a fuel-inefficient Airbus A340-300 aircraft on its new route to New York JFK (which will operate via Vancouver in each direction) is particularly puzzling given that the airline has newer, more fuel-efficient 777-300ERs on order. Given the low-yielding nature of US-Filipino traffic, along with the glut of existing competition from Asian and Middle Eastern carriers, it may be more practical for PAL to reserve its widebody planes for medium-haul routes and consider partnering with a code-share carrier, or perhaps join a major global alliance, to grant it offline access to markets such as New York and beyond. PAL last served the New York market in 1997, operating a thrice weekly Manila – Vancouver – Newark routing on a MD-11. The route became a casualty of the Asian Economic Crisis of the late 1990s, and its absence was sustained during later years due to continued downturn in the global economy post 9/11, SARS, the 2005 Asian tsunami, the Global Financial Crisis and then leading up until PAL’s placement under Category 2 restrictions in 2008. Canada’s previous bilateral agreements with the Philippines enabled PAL to operate 7 weekly frequencies between the two countries. 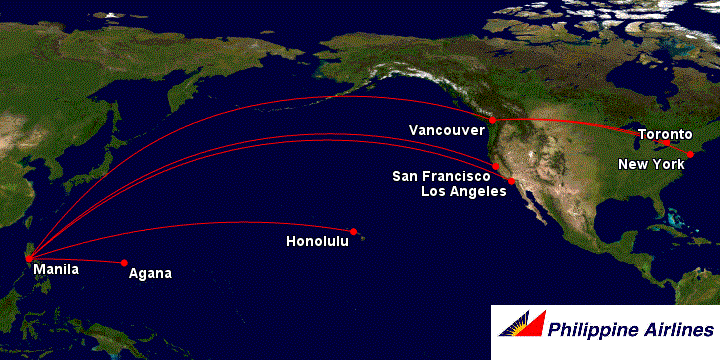 Of these, 3 of the weekly services from Manila to Vancouver presently continue onward to Toronto, operated on a Boeing 777-300ER aircraft, PAL’s newest long-haul widebody plane. With the enhanced air services agreement in place as of 01-September 2014, Canada and the Philippines now have double the allotment, with frequencies increasing to 14 weekly flights between the two nations, as well as 5 weekly fifth-freedom rights to operate planes onward from Canada to other foreign countries. PAL had previously been entitled to 4 weekly fifth-freedom rights from Canada to the United States, which it used on a Vancouver – Las Vegas route that was discontinued in December 2012. Under Category 2 restrictions, PAL was unable to recuperate these rights and reallocate them to serve another US market (such as New York) until restoration to Category 1. In the interim period during PAL’s absence from New York, several of its regional competitors from Southeast Asia, namely Thai Airways, Malaysia Airlines and Singapore Airlines, have all entered and exited the New York market, either on a nonstop basis or on fifth freedom routes. The only carrier to remain is Singapore Airlines, which operates via Frankfurt. However, SIA and Thai pulled their nonstop New York – Singapore and New York – Bangkok routes, respectively, and MAS cancelled its Newark – Stockholm – Kuala Lumpur service in 2004. It then begs the question as to how PAL believes that it can achieve success in a similar fashion by operating a 4-weekly service that must make a technical stopover in Vancouver bi-directionally from New York. Delta currently offers a direct service from New York to Manila via Tokyo Narita, which appeals to both New York-based Delta elites as well as passengers seeking to connect to other Asian destinations at Narita. PAL will have the advantage of connecting passengers to domestic points beyond Manila, but this will still require a 2-stop itinerary for travelers originating or terminating in New York. PAL’s most formidable challenge, however, will be Cathay Pacific on this route. Not only does Cathay offer 5 daily flights into the New York area airports (4 into JFK, 1 into Newark), one of the JFK flights does make a technical stopover in Vancouver. The New York – Vancouver route is a fifth freedom sector that Cathay Pacific inherited prior to the advent of longer range aircraft that can operate from New York to Hong Kong nonstop, but even in the age with extended-range jets, the New York to Vancouver route has still proven to be a profitable niche market for Cathay. Given that it not only allows for local traffic rights between New York and Vancouver, but also permits Cathay to pick-up additional passengers in Vancouver, the route operates as a supplement to its four other New York – Hong Kong nonstops. Again, this poses a challenge for PAL, given that the New York – Vancouver flight on Cathay operates daily, as opposed to PAL’s 4-weekly proposal, and also offers a much more premium product on a newer aircraft. However, even if PAL offered a more appealing premium product, the vast majority of inbound and outbound traffic into the Philippines is comprised of price-sensitive traffic, often willing to book travel on circuitous routes in favor of cheaper airfare. Even the Big Three Gulf carriers, Etihad, Qatar and Emirates, are known for offering competitive prices from US markets to Southeast Asia via Abu Dhabi, Doha and Dubai. Understandably, PAL has faced many setbacks preventing it from growing its long-haul operations. However, with a fleet of only 6 777-300ERs, the carrier will need to order more widebody planes to continue its growth plans in the United States. In the short-term, it can fill the void with older generation aircraft, but over the long-term, the Airbus A340 will likely be unsustainable.